The existing Daikin VRV air conditioning system had suffered a major refrigerant leak, after exhaustive pressure tests, the leak was located within the underground AC copper piping services. Due to the civils works required to replace these underground services the client requested that the these be replaced above ground. 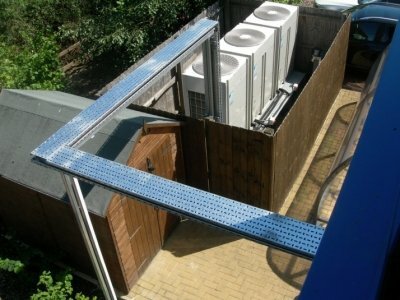 We therefore designed an overhead cable tray gantry system to enable continued access. Installation of the overhead gantry and piping services were carried out prior to the disconnection of the leaking pipe work area. The refrigerant from the system was decanted into receiver bottles, the existing leaking pipe work disconnected and new pipe services connected, the system was then pressure tested and evacuated to manufactures recommendation’s prior to adding recovered refrigerant, system then fully run, tested and re-commissioned.